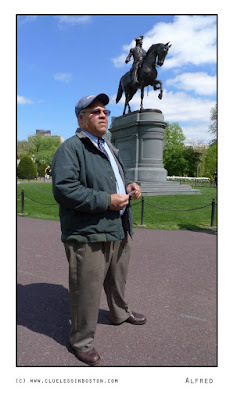 I met Alfred in the Public Garden the same day I met the 4 Lovely Latinas, previously seen on this blog. He spied me crouching in the grass taking pictures of the tulips and he struck up a conversation. Alfred is a photographer too and was naturally interested in what setting I using, what I was seeing, etc. A naturally gregarious man, Alfred was very easy to talk to. He had heard of the 100 Strangers Project and was very willing to participate and pose for me. Being a good photographer Alfred suggested I take a second shot because he thought his hat may have cast a shadow on his face, and he was right. The second shot was better. Alfred told me he lives on the Cape (Cape Cod) and works in Boston as a Career Counselor so he has been very busy lately. Most of his photography is done on the Cape, but he hasn't quite made the philosophical move to digital, yet. However, he did say he owns both a Nikon D80 and a Panasonic Lumix so he is serious about his photography. It was a pleasure meeting you Alfred and I hope next time we meet you have your camera and maybe I can return the favor and pose for you. But the result is one more interesting portrait for us. Thank to both of you! Ah great minds... ;-) It's a lovely composition... who is the statue? I love that Alfred is wearing a tie. Hi Alfred! It's nice to make your acquaintance! wow Alfred is so kind! These portraits are working out well for you. This is very nice and he seems like a very nice man. The statue in the background, if a horse has both feet up, it means that the person died in battle. If the horse has one feet up, it means that the person was injured. Both feet down means, he's came out alive from the battle. Super portrait. how lovely to strike up a conversation with this gentleman. I am always surprised when people are so willing to be photographed cos I hate being photographed myself!